It’s that time of year again: time to plug my products remind you how easy it is to send your holiday cards and invitations with the Deliverator! Instead of going through the chore of opening your friend’s profiles and dragging the item onto them, one by one, until you get RDNDI (Repetitive Drag-N-Drop Injury) — just put the item and a list of recipients into your Deliverator and let it do the boring part while you munch on gingerbread cookies and watch TV. P.S. Don’t forget, Cephalopodmas is just 3 days away! A Squidogram always makes for a slimy and surprising souvenier for that special someone. Just L$50, with 5 packs and 10 packs at a discount! Deliverator – Now Deliverating to More People! Deliverator users, rejoice! I’ve upgraded the server to be better than ever: Deliverator can now deliver to practically anyone in SL! If you’ve had trouble delivering to certain people, those troubles are a thing of the past! The only people Deliverator might not be able to deliver to are super-newbies, less than a day or two old — and you can just try again the next day and it’ll probably find them. Woo! This improvement was on the server, so you don’t even have to upgrade your Deliverators or anything like that. It’s magic! 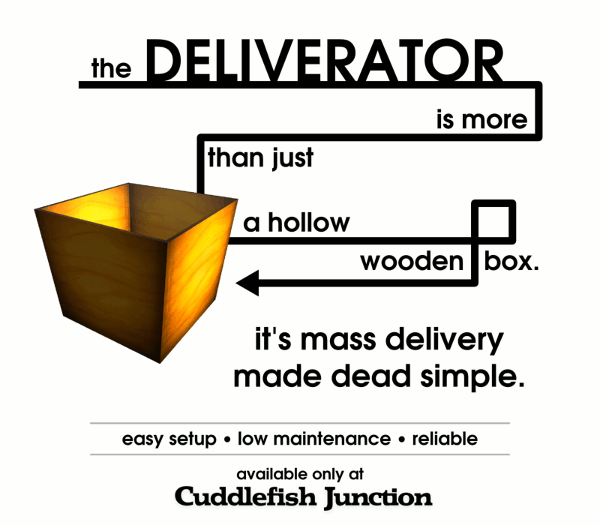 As always, the Deliverator is available for just $500, only at Cuddlefish Junction. It’s totally the easiest way to send out gifts, invitations, and other items to your friends or customers! And you don’t even have to make them click some silly sign!